Story Line: Two brothers resort to desperate measures as they embark on a series of bank robberies in order to protect their family home in this stunning modern Western. Beautiful cinemtography and incredible performances are just some of the highlights of this sumptuous homage to the Western genre which intelligently embeds the modern-day climate into its setting. Difficult to understand the thick Texan accents at times, and strange to discover that it was filmed in New Mexico despite the film being an homage to Texas. Mackenzie really does deserve much of the praise, though, for this fantastic piece of film making. 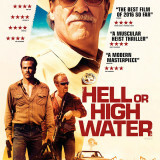 Hell Or High Water is so steadily paced yet creates a significant amount of tension as a race against time evolves. He draws incredible performances from his leads, provides his audience with stunning visuals and touches upon themes which set this way above a typical heist movie or generic Western. Chris Pine and Ben Foster star as bank robbing brothers in this superb modern Western from Starred Up Director David Mackenzie. With a screenplay written by the acclaimed Taylor Sheridan (who recently wrote the screenplay for the brilliant Sicario), Hell Or High Water is a tense, taut and brooding crime drama set in present day Texas. The plot is a simple one: the family ranch is on the verge of being repossessed by the bank, so Pine resorts to desperate measures and teams up with his criminal brother Foster as they embark on a series of bank robberies in order to raise the cash to secure the ranch. They are soon pursued by Jeff Bridges’ almost-retired Texas Ranger as they work their way through a number of small, near-desolate Texan towns. However, whilst the premise here may be straightforward, Mackenzie actually offers us something hugely substantial. The quiet Texan towns and the desperation of the brothers are just some of the methods in which Mackenzie shows us how the global economic crisis has had, and still has, a devastating effect on people (it reminded me of the under-rated Killing Them Softly in that regard). We see a waitress desperate to hang onto a generous tip, houses for sale and a number of roadside billboards and posters offering loans and debt consolidation schemes. Indeed, the banks themselves are very much portrayed as the villain here, and as such it’s very hard not to want to root for Pine and Foster as they cleverly seek to steal the money they need from the very branch they owe, so that they can make the necessary payments with the bank’s own money. Considering this is a story that could perhaps have been set in any town, any state, or any country even, Hell Or High Water felt very much like an homage to the genre of Western movies but also to Texas itself. The sumptuous sweeping shots of the towns and absolutely gorgeous photography of untouched prairie landscapes felt as if they were intended to show the state of Texas in both its expansive and desolate glory, whilst providing the audience with a nod to the great Westerns of old (High Noon, The Searchers and True Grit all springing to mind; the latter of course aptly remade with Jeff Bridges). Credit must go to Mackenzie for superbly merging the old with the new here. This is ultimately a story founded on the 21st century economic crisis, yet set in what is ultimately a 19th century backdrop. One scene in particular that stood out for me was when the brothers were filling up their car at a gas station; a cowboy (stetson and all) leaves the scene on horseback as two young kids drive up blaring out heavy metal music from their car. Later, we see Jeff Bridges’ Texas Ranger and his partner held up in their car as they wait for a group of cowboys to drive their cattle across the road. These were odd juxtapositions but they perhaps serve to highlight this fundamental theme within the film. Numerous references to Native Americans (Comanches in particular) further enhance this idea; the acknowledgement of what once was. Again, though, there is more substance here, in that these references serve to point out an irony that the citizens of today’s America are having everything taken away from them (by the banks) as the Native Americans had everything taken away from them (of course the circumstances here are vastly different). Most of these references were made by Bridges’ character; perhaps the personification of this sense of ‘the old’. Reluctantly approaching retirement and making constant racist comments to his partner, Bridges is world-weary and worn out (so much so that you would be forgiven for thinking this was a role intended for Tommy Lee Jones) with nothing to look forward to. Tracking down the brothers is his ‘one last job’ and one he embraces obsessively as a means to stave off his retirement. He is the epitome of ‘old school’ in his humour, methods and etiquette, but it is clear he is also terrified of entering a world he is unfamiliar with. It’s a fantastic performance from Bridges, who emotes and conveys awkward humour, obsession and fear in his own unique way. Countering Bridges is the ever brilliant Ben Foster. The oldest of the brothers, he’s street smart, unpredictable, ill-tempered, quick-witted and reckless; and the personification of “the new”. It’s his actions which give the brothers’ journey an overwhelming sense of uncertainty and excitement and yet despite his copious flaws, Foster manages to make his character an endearing one. This is Chris Pine’s vehicle, though. It’s a restrained and thoughtful performance, and with that an intensely brooding one which encapsulates the entire tone of the film. It is Pine’s younger brother who has masterminded the whole scheme to obtain the money, whilst getting revenge on the bank that has caused his family so much grief. It is he who has asked his brother to revert back to a life of crime. He is doing a bad thing in order to do a good thing, and there is barely a scene in which Pine is involved where we don’t see the remorse and the shame etched across his face. It’s a role which could not be further than that which made his name (as James Kirk in the Star Trek franchise) yet one he commands with great maturity. 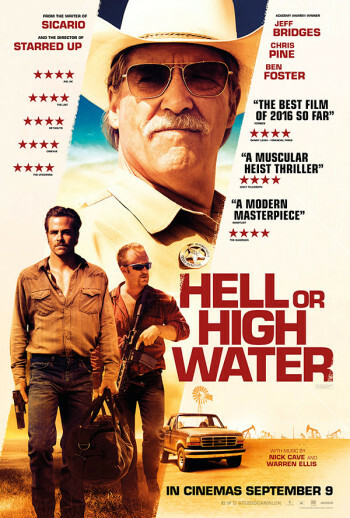 The only issue I have is that I discovered Hell Or High Water was actually filmed in New Mexico, which seems odd when considering how this is very much a love letter to the state of Texas which in itself features as such an integral character. Other than this minor gripe, I thought this was utterly superb and I highly recommend it as a solid, intricate drama.